This morning I read a quote from Steve Jobs that hit me harder than a fourth cup of coffee. Now, I had been having a bad couple of days this week; nothing earth shatteringly awful, just a nagging sense of boredom and frustration at sub-par results in my business. But here’s the thing: If you're in business for yourself, like me, and you find that you're bored or unmotivated by your work, it's going to kill your business faster than any competitor ever could. So I looked in the mirror and asked myself the Steve Jobs question: "If today were the last day of my life, would I want to do what I am about to do today?" And ... I knew I needed to change some things -- right away. First, I put on some different background music in my office and promptly wrote a really good promotion for a client that I know he’s going to love. Oh, and, I finished two hours early. Then I shaved and put on a clean shirt with a collar (two things I don't do a typical work day) and I recorded two promotional videos for my business. Now I would rather drink paint than shoot a video. But by making the videos, I forced myself to get out of my comfort zone and grow a little bit. The answer, yes or no, is probably true -- if you listen to your heart. At the risk of sounding obvious, if the answer is no, make changes to your plan. Even if you don't have 100% control over your schedule, you do have 100% control over your attitude, which controls everything you do. And you can change your attitude by changing your surroundings: the music in your work space, pictures on the wall, conversations you have (or don’t have), the blogs you read (or ignore), the thoughts in your head. That's my thought for today. It’s made my day today more productive than all of yesterday -- and it’s not even lunch time yet. What do you think? Please share your thoughts in the comment below. 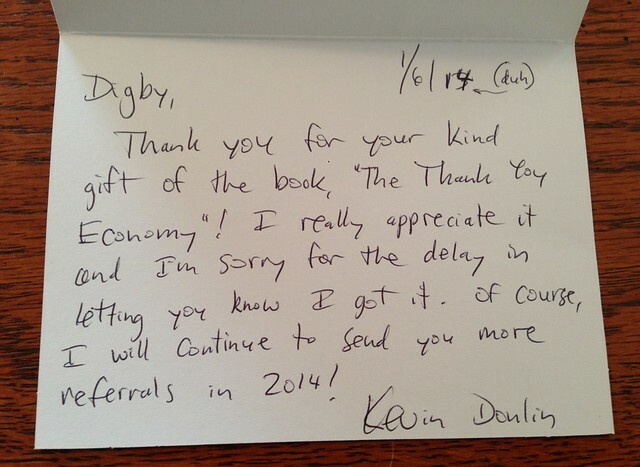 This final post in this Thank-You Marketing series is a lesson within a lesson on how to get more referrals. Digby is one of about a half dozen copywriters I know pretty well and have referred business to. What? Send my leads to another copywriter? Of course. I do it all the time. You should, too. Because no matter what your business or how versatile you are, there will always be projects you can't or won't want to do. You can either turn those leads out into the cold with a simple rejection, or say something like this: "My expertise doesn't match with your needs, but I know a guy/gal you should talk to ..." Then send your lead to a competitor whom you know and trust. Your prospect will appreciate your help steering them to another vendor -- and possibly refer a more-suitable person or project to you later. Your competitor will appreciate your sending them a lead -- and probably refer a person or project to you later. That's a win-win in any book. ... which makes it about 100% likely that I will continue to send referrals his way. 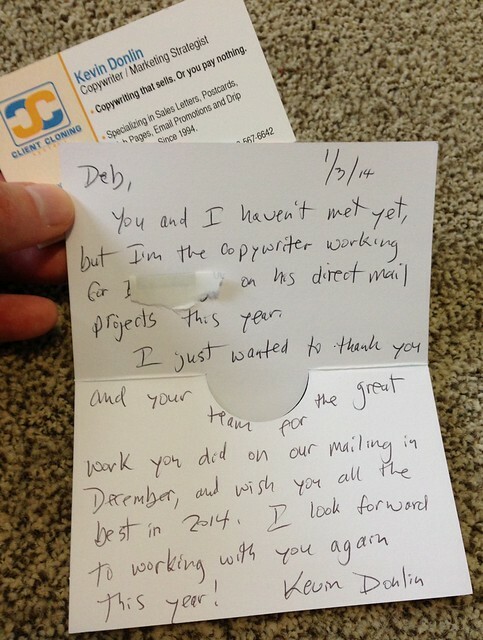 You could file today's thank-you note under Strategic Gratitude. 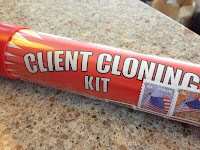 That's because I'm writing to thank a potential referral partner for her work on a recent copywriting project. She's manager at one of America's leading printers for direct mail -- a potentially fantastic referral partner for me. She did a great job for my client and me recently. So, I want to make sure she knows how much I appreciate her efforts. Remember: You're not remarkable if nobody is talking about you. Simple little thank-you notes, written and mailed with a stamp, are an easy way to start conversations about you -- for all the right reasons. And that always leads to referrals. That incredibly delicious box of chocolates was dropped off on New Year's Eve by my ace printer, Jim Beckman from Full Throttle Print. Almost every business depends on referrals, but few businesses deserve them to the extent that Jim's does. He's more like a concierge than a printer -- I've never heard him say "No" to a request in the 3 years I've been using him to print business cards, newsletters, flyers, and sales letters for me. 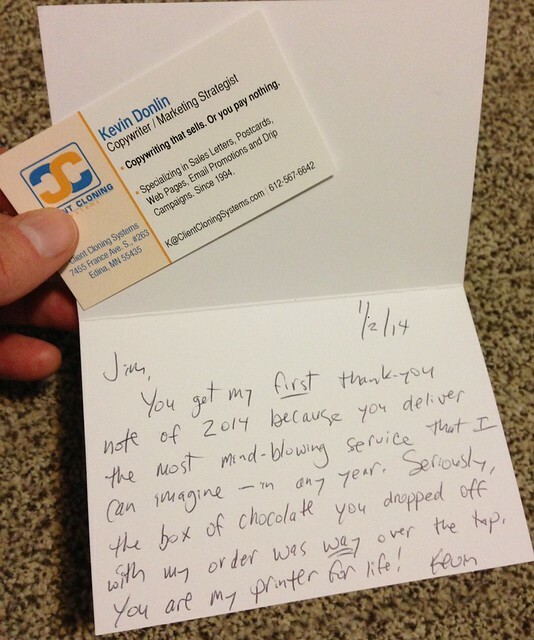 The fact that he delivers at no charge is just icing on the cake. 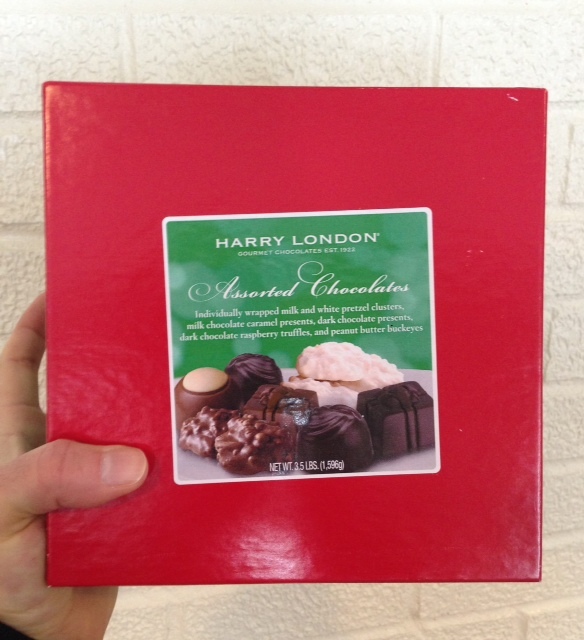 And the nice gift of chocolates? Wow. That's icing on the ... chocolate. Or something. Anyway, why I will never use another local printer as long as Jim is in business. And I will continue to refer my local clients to him. Bottom line: You can recession-proof your business (heck, you can Obama-proof it) by delivering service that surprises and delights your clients. They will buy more and refer others to you. It's just that simple. Because, in a world where nearly everything can be copied or done for $1 an hour in China, there's one thing no competitor can copy: your service. Make sure yours is memorable -- for all the right reasons -- and you will have clients for life. Like Jim does.